Sometimes people approach me with: But Tofu doesn’t have any taste! I think that’s a bit unfair. Tofu is definitely that kind of food people love to passionately exchange opinions about. Some people hate tofu, some think it is unhealthy and so on. 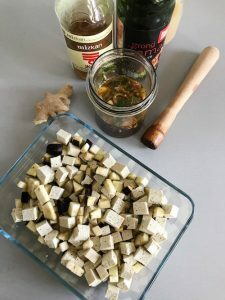 For a food that has been invented 2000 years ago and since then has been eaten all over the world tofu is still so misunderstood. If you tip the word Tofu into google this is what you get: Cheese-like flavorless food made from soybeans. Flavorless – a devastating verdict! But what about chicken or mozzarella when eaten raw or only prepared in the pan with a little salt? Aren’t all of them blank canvas? Ready to get colored with your favorite flavours. This recipe is very adjustable. You can play with different ingredientes such as spices, fresh herbs, acids (e.g. lemon, vinegar, citrus) or fruits (e.g. oranges, passion fruit, raspberries). Let’s talk about the health benefits of Tofu: all soy foods are very high in protein, calcium, and iron while low in fat, saturated fat and cholesterol. As a result you can lower your cholesterol and reduce the risk of some cancers as well as heart disease. Soy also contains isoflavones which show tremendous potential to fight disease on several fronts. For those new to soy it is recommendable to add soy slowly to your diet. Make sure you buy tofu that is made from organic and non-GMO soybeans. 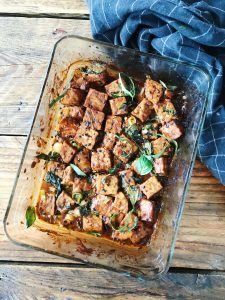 Here I am sharing one of my favorite ways to prepare Tofu as you can prepare it a day before and then just put it in the oven the next day. You can also prepare this dish with Tempeh instead (mmmh I like it even better). 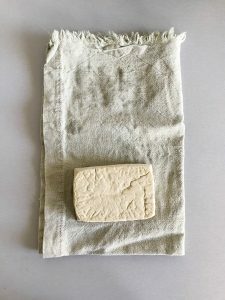 Press Tofu! Thats a very important step that should always be done when working with Tofu as you will replace the water by a flavourful marinade. 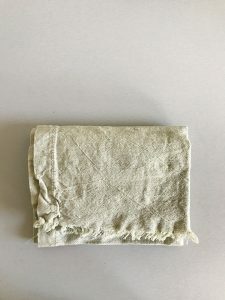 Here’s how to press tofu: Take a clean kitchen towel, fold it several times to rectangle. 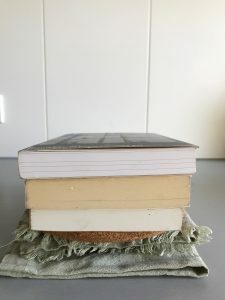 Place the tofu block on one of the short rectangle sides so you can flip over the other short side to cover the tofu completely.Place a heavy object on top of the towel. Let sit for about 20 min. Mix the Marinade. This is the fun part. 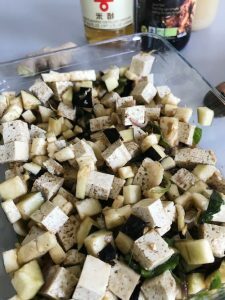 You want to make a good amount of Marinade to infuse the Tofu and the Eggplant. To make 200ml of Marinade: take a glass jar and fill in 100ml of Water. Now add all Marinade ingredientes but the onion and the garlic. Pestle the Thai Basilikum Leaves and Lemongrass Stalks and then add Garlic and Onion. 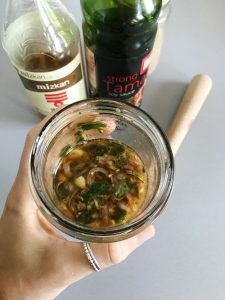 Taste the Marinade and adjust with more Lemon, Soy Sauce, Chilli, Sesame Oil or more Rice Vinegar. You want to achieve an intense flavour. 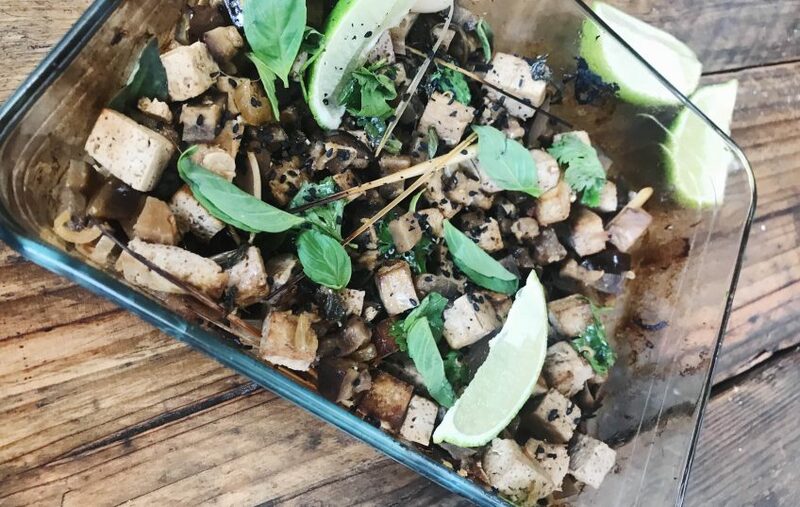 Combine Tofu and Eggplant with Marinade in an baking dish and let sit for 2- 24hours. Bake for up to 45 minutes on 180 degree. Garnish with Sesame Seeds, lime wedges, Green Onions, fresh Thai Basilikum and Cilantro. Serve with Rice or Buckwheat. I am Yvonne, founder of Yoga Spirit Circle. I love yoga and nature as well as to organize events and to be a host. More about me and Yoga Spirit Circle on our ABOUT US page.